The conference will be held inside the campus of the Universitat Politècnica de València in Valencia, Spain. The UPV is a public, dynamic and innovative institute that is dedicated to research and teaching. It maintains strong bonds with its social environment and a strong presence abroad. Currently, its university community consists of over 42,000 people. Of these, nearly 37,800 are students, 2600 are members of the teaching and research staff and 1700 are administrative and services personnel. The UPV is made up of 10 schools, 3 faculties and 2 higher polytechnic schools. The University’s research institutes are highly valued centres devoted to either artistic, technical and/or scientific research. One of them, the Institute of Telecommunications and Multimedia Applications (iTEAM) is a research centre integrated in the Polytechnic City of Innovation, the new science park located at the UPV. The iTEAM performs its research and development (R&D) activities in the field of Information Society Technologies (IST). It is made up of 8 research groups recognized by UPV, gathering more than 100 researchers and covering 5 scientific areas related to telecommunication engineering. One of the groups is the Mobile Communications Group (MCG), which is composed of about 30 professors and researchers working on three different fields related to the area of wireless communications: “Body Wireless Communications”, led by Prof. Narcis Cardona, “Wireless Technologies”, led by Dr. Jose Monserrat, and “Broadcast Technologies”, led by Dr. David Gómez-Barquero. From the airport to conference venue, first, take the underground line 3 to Benimaclet. Go to the street level and take the tram lines 4 to Mas del Rosari – Doctor Lluch or line 6 to Maritim-Serreria and get off the tram at Tarongers station in front of the access L and K of the UPV. To go from the hotels to the conference venue you must take the tram line 6 at Maritim-Serreria going to Tossal-del-Rei and get off at Tarongers station in front of the access L and K of the UPV. To go from the hotels to the conference banquet you can take the tram line 8 to Marina Reial and get off there. Next, a map with the metro lines and the most relevant stops is shown. For more information on underground stations, timetables and fares, please visit Valencia’s metro webpage. To go to the place of the conference by bus, you must take the lines 93 or 98 and stop at Tarongers – Col.legi Major, these stops are the closest to the place of the conference. But also, you can take line 99 and stop at Fausto Elio – Universitat Politècnica de Valéncia or take lines 40, 71 and stop Ramon Llull – Campus Tarongers, and then walk to the conference venue 10 minutes aproximatelly. In the EMT Valencia webpage, you can find extensive information on buses, fares, tickets and passes, timetables, special services for handicapped people. The IEEE BMSB 2018 organization offers a free bus to go and return to the conference venue and hotels, the schedules and stops are as follows. The bus will leave from AC Hotel Valencia (Avenue of Francia 67) to the conference venue (UPV, Nexus Building). The 6th the bus will leave at 8:00 am, while the 7th and 8th the bus will leave at 8:15 am. To return to the hotel, the bus will leave from the conference venue (UPV, Nexus Building) at 18:15, all days, to the AC Hotel Valencia (Avenue of Francia 67). All hotels are close to each other, so you can walk from the stop to the rest of the hotels where you are accommodated. Also you can take the bus to go to the conference banquet the 7th. The bus wil leave from AC Hotel Valencia at 20:00 to La Marítima Restaurant (Veles e Vents Building). After gala dinner, the bus will back from the restaurant to AC Hotel Valencia (Avenue of Francia 67) at 23:15 approximately. 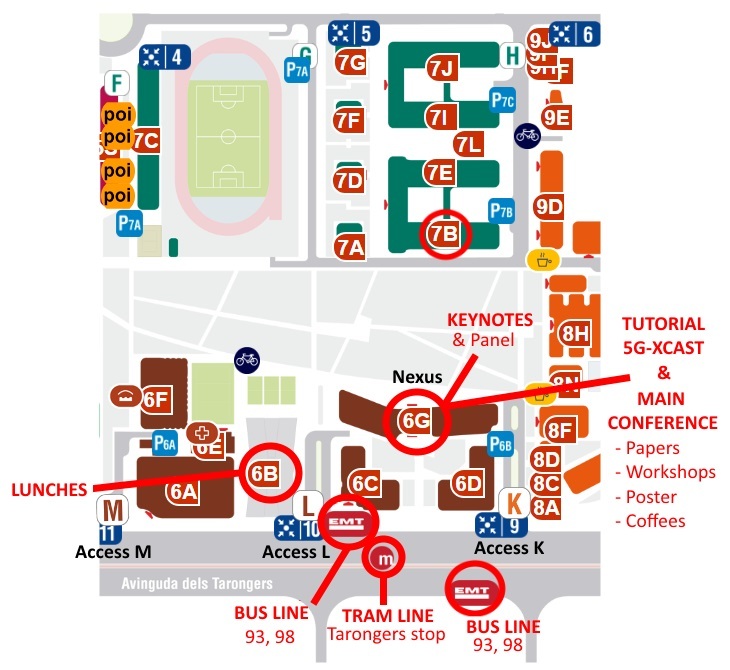 If you take a taxi, please tell the taxi driver to take you to the following location: Universitat Politècnica de València, entrance L or meeting point 10 (Galileo Galilei dormitory), in front of “Tarongers” tram station; once there, go to the Nexus Building (6G). To go to other place (hotels, conference banquet…), please tell the location to the driver.